It’s time to revoke laws that support the foreign aristocracy of invading fossil fuel companies. Oil and gas companies could no longer exercise eminent domain in Nebraska under a bill heard by the Judiciary Committee March 11. 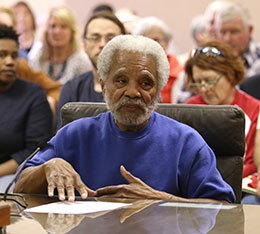 LB473, introduced by Omaha Sen. Ernie Chambers, would repeal two provisions of the Major Oil Pipeline Siting Act: the right of eminent domain granted to oil and gas companies and the requirement that they seek approval of the governor when siting a major oil pipeline…. The act, approved by the Legislature during a 2011 special session, was designed to provide a regulatory framework for siting oil pipelines in the state. It was amended in 2012 to give the governor authority to approve major oil pipeline routes. Concern over the state’s pipeline regulations was prompted by TransCanada’s proposed Keystone XL pipeline, which would carry crude oil from Canada to Gulf Coast oil refineries. The pipeline’s original route would have traversed the Ogallala Aquifer and Nebraska Sandhills. And why should eminent domain apply anywhere to Spectra Energy’s proposed Sabal Trail fracked methane pipeline to LNG export in Florida, through our drinking water Floridan Aquifer?